Watercolour has long been considered a medium that is difficult to master, reserved for picturesque landscapes. If you think watercolour is boring, think again. Explore Illustrator Veronica Ballart Lilja's new guide to watercolour ‘If You’re Bored With Watercolour Read This Book’ as she shares her tutorials for luminous colour mixing, dynamic compositions and media combinations. Combine comb-flicking and toothbrush mark-making with how to layer colour and mixing shades for the perfect wash, with Veronica’s easy to follow tutorials set to transform your approach to watercolour. Hi Veronica! You’ve travelled the world working with a variety of different brands and creative projects. Can you tell us a little more about your experience as a freelance illustrator? I’ve been working as a freelancer for almost 10 years now and it’s always a challenge. There’s more pressure and responsibility than working in a company, but you get to be your own boss and you can work from anywhere! I like to work on my own, but this can sometimes get a bit lonely – I currently work in a studio with a few other freelancers so that’s the perfect balance for me. What first drew you to watercolour? I love that watercolour doesn’t need to be perfect to look good and there are so many interesting effects you can achieve with it. It’s a really versatile medium that can be difficult to control – but that’s what makes it fun – you can play around with texture, shapes, colour and mix it with a range of media, everything from Chinese ink to charcoal and even embroidery to get some great effects. How did you come up with your creative tutorials? As a professional illustrator, I get asked a lot how I produce the effects in my artwork and people asking if they can come to the studio to see how I work. So the book is my way of showing the techniques that I’ve enjoyed using over the years for my illustrations, so that everyone else can learn how to do them too. You make a range of marks with unconventional tools. How did you discover the possibilities of combs, toothbrushes and sponges? I had a very good teacher in Barcelona who taught us how to use things that you can find around the house! It’s amazing what you can do with things that are just lying around, and then it’s just a case of experimenting and experience to see what works best. You use a variety of watercolour in different ways - from sticks and crayons to pencils and pans – do you have a preference? Does each change how you approach a different watercolour technique? I like using liquid watercolours the most because the colours are so vibrant and they're really good for creating splash effects and textures. But some techniques work better with different types of watercolour, so it can depend on what effect you want to achieve what type of watercolour it would be best to use. In the book I give some pros and cons of different types of watercolour and also give tips on what type of watercolour works well for particular tutorials. What techniques have you found most difficult to develop and how did you overcome the challenge? For me, it’s most challenging doing the illustration where I mix a pencil drawing with watercolour, because it can take quite a long time to be able to achieve the realistic style of illustration I want with it. But as with everything, it’s all about practice and not worrying too much about making mistakes. 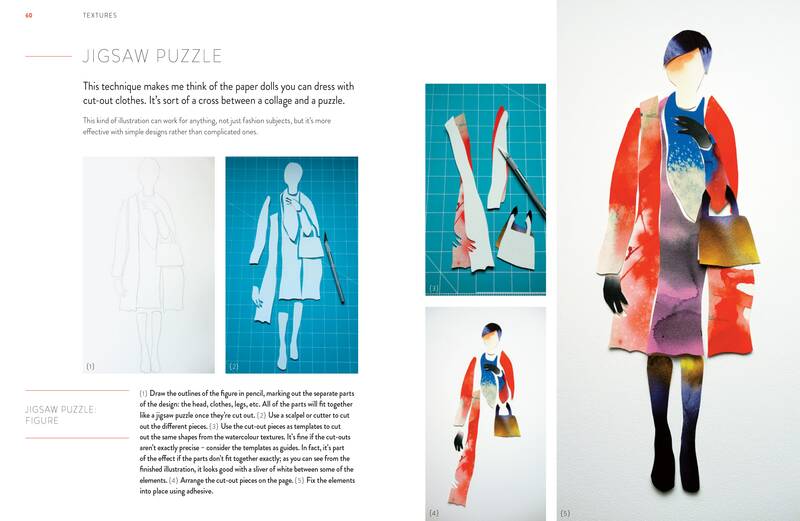 You combine watercolour with different media, including oil pastels, embroidery and collage. How does combining watercolour with other media change your process? It can be quite risky, because you never know exactly what result you’re going to get. It can also take more time because you have to take into account the other processes and media you’re working with, but it’s a lot of fun and you can create some really exciting work. Many of your illustrations have quite defined blocks of colour, shapes and silhouettes. How have you developed this style? Good question. I think it’s been quite a natural process. As an illustrator, it’s important to have a personal style and try to develop it, and keep looking for new goals. For me, I like that you can actually be very bold with watercolour by using bright colours, block shapes and clean silhouettes. And that that’s different to how a lot of people would assume watercolour illustration is like – people tend to think of it as gentle and old-fashioned! – and I want to show that it doesn’t have to be like that! What would your advice be for anyone experimenting with watercolour for the first time? Just take your time and don't be afraid to try new things and get dirty! You’ll soon discover how fun it is and how easy it can be working with watercolour. 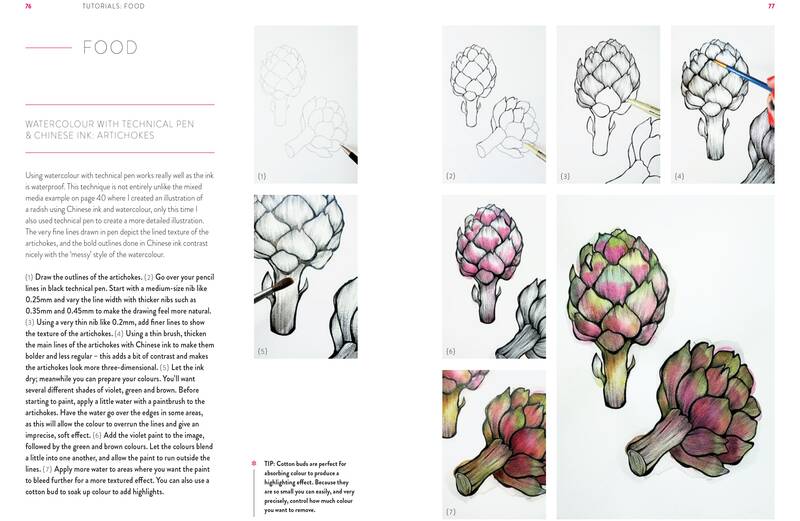 Veronica Ballart Lilja’s Illustrative Watercolour Guide ‘If You’re Bored With Watercolour Read This Book’ is available to buy online and in-store at Cass Art! Follow Veronica's step-by-step guide to combining different techniques to create an abstract, textured bird in our How To Blog. View more of Veronica’s work on her website at www.veronicaballart.com or on her Instagram. Explore our range of watercolour and try your hand at Veornica’s watercolour tutorials.